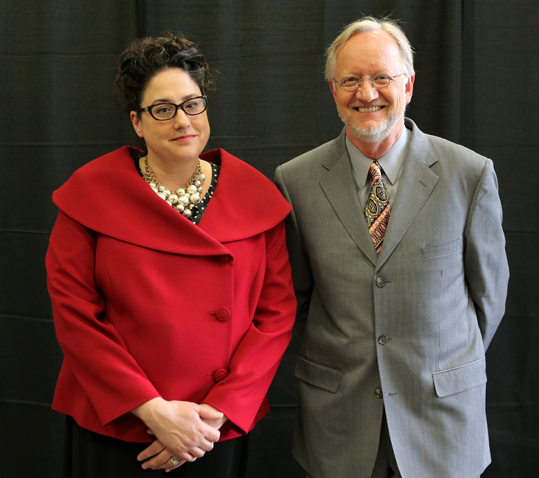 Michelle Sullivan and Dr. Johan Gottgens won Outstanding Adviser Awards. Dr. Johan Gottgens, professor and associate chair of the Department of Environmental Sciences in the College of Natural Sciences and Mathematics. He joined the faculty in 1993. Michelle Sullivan, academic adviser in the colleges of Languages, Literature and Social Sciences, Natural Sciences and Mathematics, and Communication and the Arts. She joined the UT staff in 2012. 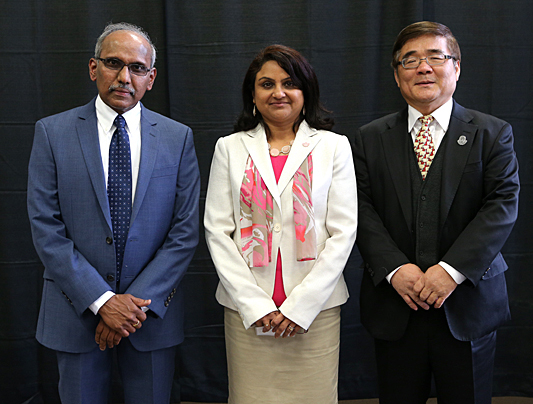 Outstanding Researcher Awards went to Dr. Sasidhar Varanasi, left, Dr. Bina Joe and Dr. Paul Hong. Dr. Paul Hong, professor in the Department of Information Operations and Technology Management in the College of Business and Innovation. He joined the faculty in 1987 and received his PhD from the University in 2000. His research interests focus on global supply chain management, including new product development and innovation; supplier relationships; operational transformation; and strategic integration of front-end and back-end business processes. Dr. Bina Joe, professor in the Department of Physiology and Pharmacology in the College of Pharmacy and Pharmaceutical Sciences, and director of the Center for Hypertension and Personalized Medicine. She joined the faculty in 2001. She is an internationally recognized leader in the field of genetic determinants of hypertension. Her work has helped identify risk factors associated with high blood pressure, which plays a major role in cardiovascular and renal disease. Dr. Sasidhar Varanasi, professor of chemical engineering in the College of Engineering. He joined the faculty in 1983. He has made noteworthy research contributions in the areas of sustainable energy production and green engineering, with particular emphasis on biomass conversion to fuels and prevention of greenhouse gas emissions. He has developed innovative solutions to national problems related to fossil fuel consumption. 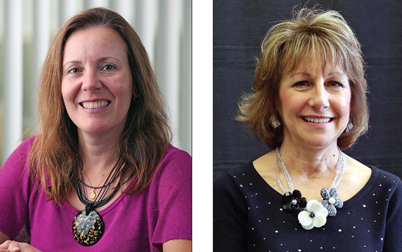 Dr. Isabel Escobar and Susan Parks received the Edith Rathbun Award for Outreach and Engagement. Dr. Isabel Escobar, professor in the Department of Chemical and Environmental Engineering and associate dean for research development and outreach in the College of Engineering. She joined the faculty in 2000. Susan Parks, associate lecturer in the Department of Curriculum and Instruction in the Judith Herb College of Education. A reading consultant and literacy coach for more than 20 years, she joined the faculty in 2009. The Outstanding Teacher Awards went to, from left, Dr. Celia Williamson, Dr. Sue Wambold, Dr. Cyndee Gruden, Diane Marker, Dr. Melissa Gregory and Dr. Doina Chichernea. Dr. Doina Chichernea, assistant professor in the Department of Finance in the College of Business and Innovation. She has been teaching at the University since 2009. Dr. Melissa Gregory, associate professor in the Department of English Language and Literature in the College of Languages, Literature and Social Sciences. She joined the faculty in 2002. Dr. Cyndee Gruden, associate professor in the Department of Civil Engineering in the College of Engineering. She began teaching at UT in 2003. Diane Marker, professor in the Department of Applied Organizational Technology in the College of Business and Innovation. She joined the faculty in 1980. Dr. Sue Wambold, professor and chair of the Department of Kinesiology in the College of Health Sciences. She started teaching at UT in 1989. Dr. Celia Williamson, professor in the Department of Criminal Justice and Social Work in the College of Social Justice and Human Service, and director of the new Human Trafficking and Social Justice Institute. She joined the faculty in 2000. This entry was posted on Wednesday, May 6th, 2015 at 3:57 am and is filed under Alumni, Business and Innovation, Engineering, Languages, Literature and Social Sciences, Medicine and Life Sciences, Natural Sciences and Mathematics, News, Pharmacy and Pharmaceutical Sciences, Research, UT Health, UToday, — Communication and the Arts, — Judith Herb College of Education, — Social Justice and Human Service .